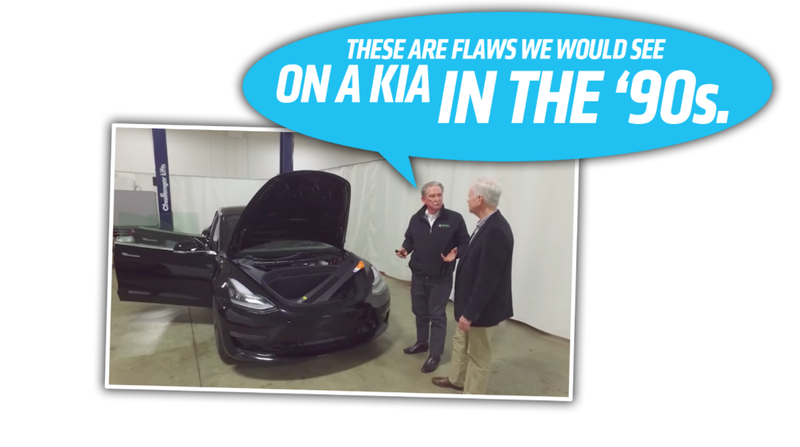 Autoline’s John McElroy spoke with engineering and manufacturing expert Sandy Munro about one of his company’s newest tear-down acquisitions: a Tesla Model 3. Munro was unimpressed with the build quality. This is an ﻿afterthought or something...You’re not supposed to just glue on another piece. Usually you take whatever’s wrong and pull it out and put another one in...Geez, I never saw that before. Let’s just have a look at...the gaps. If we look over here, I can barely get my fingernail in. And if we look over here...I can almost put my thumb in. This is... very unusual...The tolerance stack-ups on this car are just, like nothing we’ve ever seen before. Not since... the ’70s or something. I don’t understand how it got to this point.﻿ These are flaws that we would see on a Kia in the ’90s or something...I can’t imagine how they released this. It’s just a surprise. A really big surprise for me. In addition to the fit and finish issues, Munro also talks about how hard it’s going to be to tear into the Model 3, calling it a “miserable job,” and labeling Tesla engineers as “definitely electronics snobs.” He backs this up by showing how difficult it is to get to the “Front Trunk First Responder Loop,” which shuts off the high voltage system and disables the airbags. To open the frunk, where the loop is located, when the vehicle has no power requires sending 12-volts to two cables found behind a plastic trim piece in the bumper (see the diagram below). Munro also expresses frustration with the “Rear Pillar First Responder Cut Loop” at the rear pillar, which has to be severed with a circular saw. Munro also chides the Model 3's lack of a mechanical door handle in the rear. Up front, there’s a little lever in addition to the electric door-opening switch, but in the rear there’s not. In the case of an emergency that cuts the car’s power, Munro says, you’d have to fold the seats back and exit through the trunk. (Obviously, you could go through the front seats as well). This is really a heavy load. The efforts for this car are higher than almost anything we’ve ever seen. ﻿Not since the ’90s have Iseen closures like this. So that’s a bit of an issue as well.